Wanna Buy A Piece of History? Half past noon, we were all hot and needed a break. But the thought of walking to the end of the Colonnade where the tourist groups filled the tables at the all you can eat buffet restaurants did not sound appealing either. As we stood next to a pistachio tree, a donkey started braying his lungs out. His initial call trumpeted his displeasure then became a mournful crescendo about some personal tragedy. The place Jordan occupies in both political and spiritual history astounds me. It is thrilling to be able to literally see how our religions evolved and built upon the past. Only ten-percent of Petra has been excavated; yet marvelous pieces of our collective history present a unique opportunity to learn something about humanity. The Nabataean tombs were constructed during Egypt’s 18th dynasty. The 18th dynasty included Hatsheput (1479-1458BCE), the longest-reigning, queen/pharaoh, and Akhenaten (1353-1336BCE) who was called the heretic Pharaoh. Akhenaten and his queen Nefertiti abandoned Egypt’s pantheon of Gods. Within seventeen years he convinced the entire country that there was only one God. In ancient Egypt, God was called Aten or Ra. In modern times, the discovery of Tutankhamen’s tomb made the dynasty “Born of Thoth” (Thut-mosis) famous. The town surrounding Petra is Wadi Moussa, literally translated as Moses’ valley. Moses, the Bronze-Age, Jewish patriarch of the mono-theistic religions was estimated to have lived sometime between 1600-1200BCE, during Egypt’s 18th dynasty. His brother, Aaron, was buried on Mount Hor in Petra. The Nabataeans’ temple dedicated to the God Dushara and Goddess Al-Uzza was built around 30BC. After the Romans conquered Petra, the temple’s name was changed to Qasr al-Bint al-Pharaun or the Castle of the Pharaoh’s Daughter. Built about 27AD, during the Roman times, the Temple of the Winged Lions (aka Aphrodite’s temple) is dedicated to the Syrian Goddess, Atargatis. Referred to as the Fish-Goddes, Atargatis gave birth to a demi-goddess then abandoned her. Desert doves raised the baby until she was found by a royal shepherd. She became Queen Semirami leading her people to great military victories, founded Babylon and its hanging gardens, created her own religion and made her son king. The Petra Church, aka the Byzantine Church, was built on a Nabataean temple foundation about 530AD. After being buried in earthquakes, only twenty-years ago, archeologists began excavating the church. The mosaics depict the ancient symbols incorporated into the new Roman religion, Christianity. The ancient goddesses of fertility and harvest, spring, summer, fall, doves, fish, and my favorites – rabbits and roosters – paved the path towards the baptismal fountain where the water of life and resurrection was contained. And under a desert sun, water is life itself. “If you put a fence around Jordan, it would be the world’s largest museum,” the archaeologist told me. Most Westerners visit the Holy Land by flying into Israel to see Jerusalem and, perhaps, Bethlehem. Jerusalem is important, and Bethlehem is central for the Christians, but if you want to travel the Old Testament, then Jordan is the place to go. 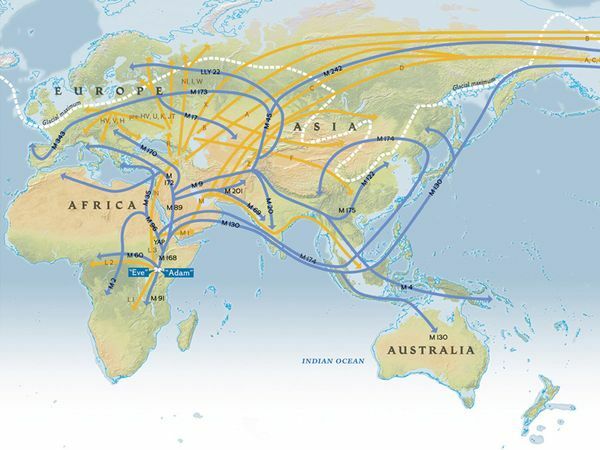 According to National Geographic’s Genographic Study, about 50,000 years ago, a large “second” migration out of Africa occurred. These became the first, large settlements in the Fertile Crescent. Modern Jordan is smack dab in the middle of recorded, human history. Jericho, located on the other side of the Jordan River in occupied Palestine, is considered to be the oldest city on Earth. But the ancient Nabataean city of Petra, inhabited by Bdouls, has been dated to the same era – 9000 BC. 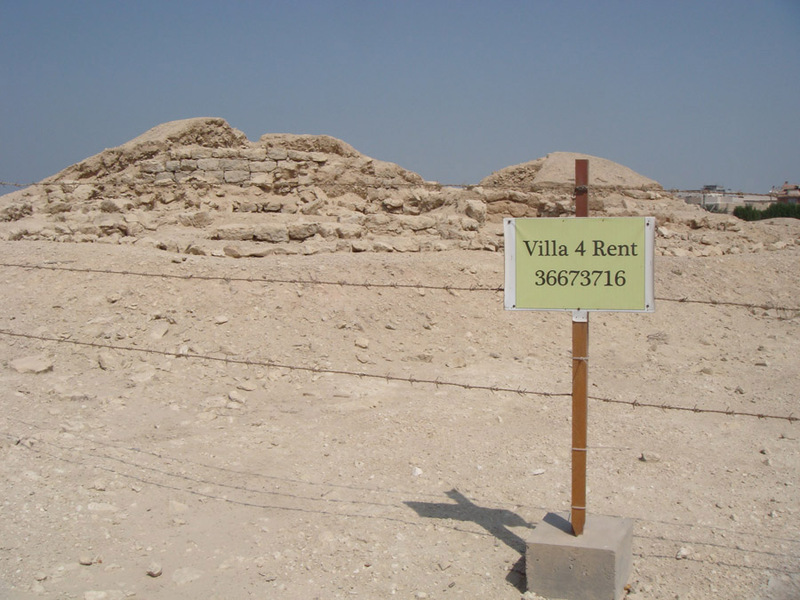 From 9000 BC onward, Jordan houses remains from every era. Copper mines are found at the Dana Reserve. Egypt’s influence is noted in pottery and jewelry. Canaanites in the Jordan Valley were first mentioned in Genesis 9:22 when Noah cursed his son Ham, the father of Canaan. Abram and his brother Lot, Genesis 11:21, split up. In Genesis 13:10, Lot choose to move to Jordan to live among the wicked Sodomites. 2300 BC Sodom and Gomorrah destroyed. Lot and his daughters found a cave to live. The cave is along the Dead Sea Highway (Highway 65), a bit south of the Dead Sea. Starting with Numbers 21:31, the Old Testament included stories about the three kingdoms of the dreaded poly-theists: the Edomites in the south, the Moabites and the Ammonites. They occupied the eastern desert of Jordan. 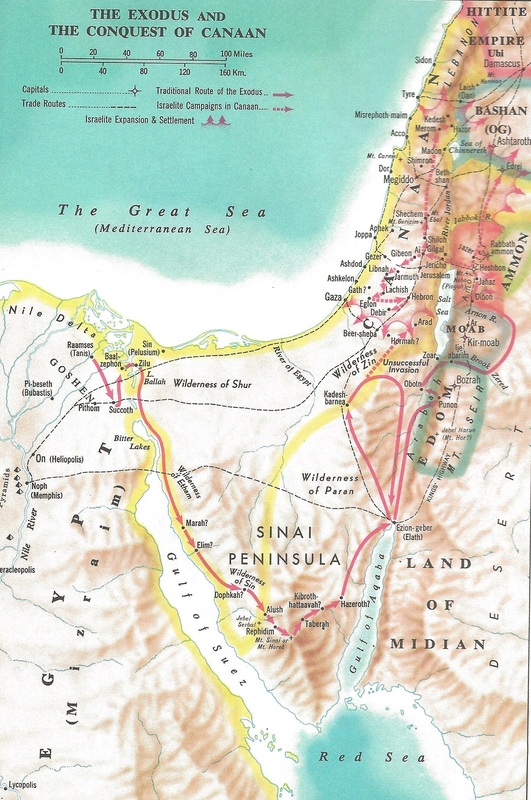 These Old Testament tribes occupied Umm Al-Rasas, Theban, Ma’in and Arnon in Jordan. It was the Edomites who blocked Moses and the Israelites. To get north, they resorted to the mountains along a road which for millennia has been called the King’s Highway. You can still drive the King’s Highway today. When Moses finally made it north, Deutoromony 34:1 says Moses went to Mount Nebo in Jordan where God showed him the Promised Land. At the foot of Mount Nebo is Moses’ spring where he is reputed to have opened a rock for his people. 850 BC Israelite Empire was defeated by the Moab king named Mesha. Numbers 32:38 talks about King Mesha who lived in Ma’in, Jordan. The Moabites worshiped Baal Maon which means God of Water and Asherah whom the ancient Sumerians called the Great Goddess. 333 BC Alexander the Great stormed through northern Jordan which became part of the largest empire ever seen. After his death, Ptolemy I became the ruler and Greek became the common language. 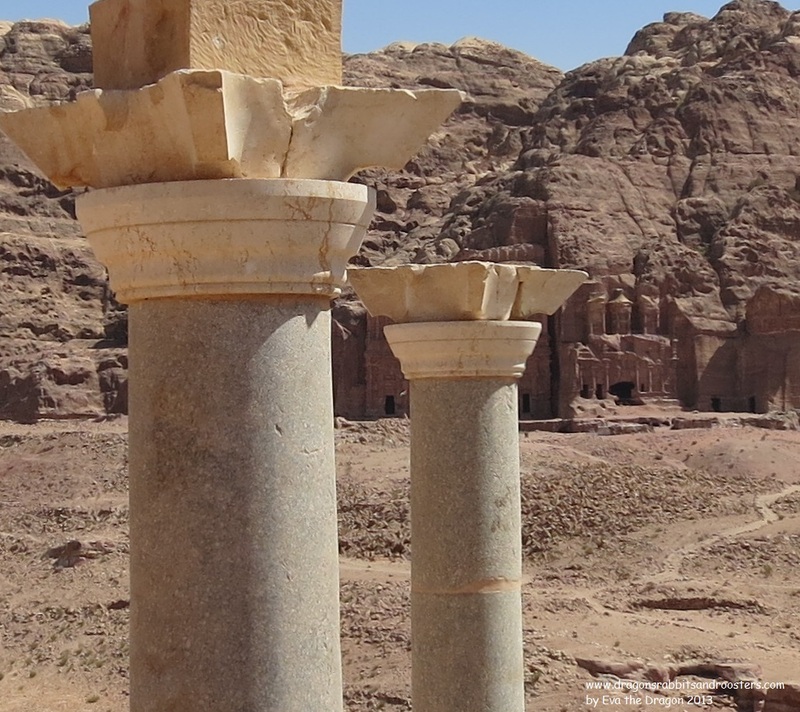 During the time of Jesus the Christ, southern Jordan was controlled by the Nabataeans from their capital in Petra. On top of Machaerus, aka Mukawir, is Herod Antipas’ castle. Here is where Herod imprisoned then beheaded John the Baptist as Salome requested. The Greek Orthodox Church in Madaba has a 6th century map depicting the entire Holy Land. St. John the Baptist Church in Madaba is dedicated to Saint John and a running well dated to the Moabite era. 64 BC Rome conquered Syria. The Romans began looking south towards the Nabataean capital, Petra, and its wealthy trade routes. 106AD Emperor Trajan finally annexed the Nabataeans and renamed the province Arabia Petraea making Petra its capital. The Roman city of Jerash, north of Amman, is the best preserved Roman city in the world – better even than Rome. 324 AD Byzantine Emperor Constantine made Christianity the official faith of the Roman Empire. At Bethany on the Jordan, a church has been excavated marking the place where Jesus was baptized. Old temples were transformed into Byzantine churches. These original churches can be seen in Madaba, Umm ar-Rasas and Petra. 632 AD Prophet Mohammed’s death. His followers began expanding north out of the Arabian desert. 629 AD Islamists lost first battle against Byzantine army near Karak castle. 636 AD Islamists won Battle of Yarmouk. 638 Jerusalem fell. 640 Syria was taken. Islam became the dominate religion and Arabic replaced Greek as lingua franca. 661-750 AD Umayyad Dynasty. During this time the Umayyad Mosque in Damascus and Dome of the Rock in Jerusalem were built. Desert castles were built in Jordan: Qasayr Amra in 711AD and Qasr Kharana 710 AD. 700 AD the Holy Wars between the Christian and Islamic armies started. 1099 Christians took Jerusalem. 1187 Islamists took Jerusalem. 1517 Ottoman Turks took Jerusalem. In Jordan, you can see the Qala’at ar-Rabad at Ajlun and the Crusader Castles at Karak, Petra and on the Pharaoh’s Island offshore of Aqaba. WWI the Ottoman Turks and Germans fought against the Egyptian-based British in Jordan’s southern desert. The Hejaz railway bombed by TE Lawrence, Lawrence of Arabia, and the Arab Revolt is still in existence. In Wadi Rum’s desert, there is a house and a spring both attributed to “Lawrence”. Further south, Lawrence stayed at both the Aqaba Fort and the Azraq Fort. There was no way we could cover all of Jordan in five days and enjoy the trip. 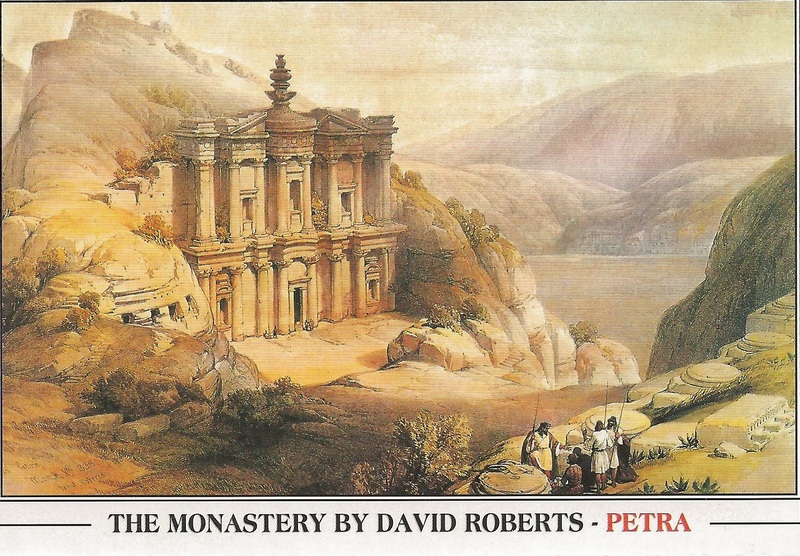 Instead we focused on the romance of TE Lawrence’s Arabia in Wadi Rum, the Rose-colored city Petra that David Roberts painted, and the easy to reach, high-points in Christian history – Mount Nebo, Bethany by the Jordan, the Dead Sea and Madaba. Lonely Planet’s Jordan is the book I rely on and carry with me. My friend Louise also found Jordan: Past and Present published by Vision Roma in Petra. This is a super fun book which helps you envision the old ruins as they looked in the past. I did not understand the owl reference and have been asking Arab people whether they could explain it. No one had an answer for me. It was after stepping into the Al Riwaq Gallery to see Letters to Ishtar that I realized the source of this very ancient, owl reference. 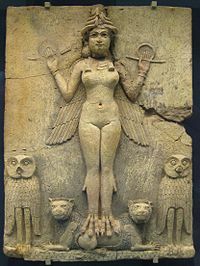 Ishtar, was the great Babylonian Goddess. The Bible referred to her as Ashtoreth and the Mother of Harlots. One of her symbols was the owl. In many depictions, she held a staff made of intertwined snakes, the caduceus’ precursor. “With exultation in my supremacy, with exultation do I, a Goddess, walk supreme; Ishtar, the Goddess of the evening, am I; Ishtar, the Goddess of morning, am I; Ishtar who opens the portals of heaven, in my supremacy.” – Poems to Ishtar. HAR meant temple of women and Harine referred to the female. spiritual rulers in Ishtar’s city, Uruk, in ancient Iraq. Bahrain’s story intertwines with Ishtar’s because she wanted to marry Gilgamesh. Gilgamesh refused her proposal. Enraged, she sent her heavenly bull to kill him. Gilgamesh, helped by his friend Enkidu, killed the bull and threw its thigh at her face. 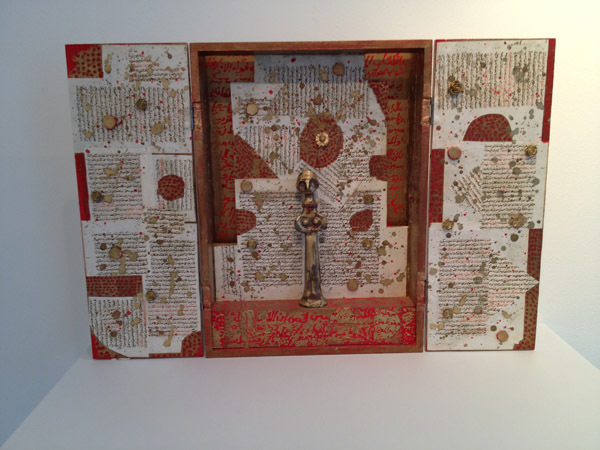 Using poetry, painting, collage and sculpture, Iraqi artist, Himat Mohamed Ali has created a dialogue about this ancient Goddess. It is on display at Al Riwaq through April 24th as part of the Spring of Culture. 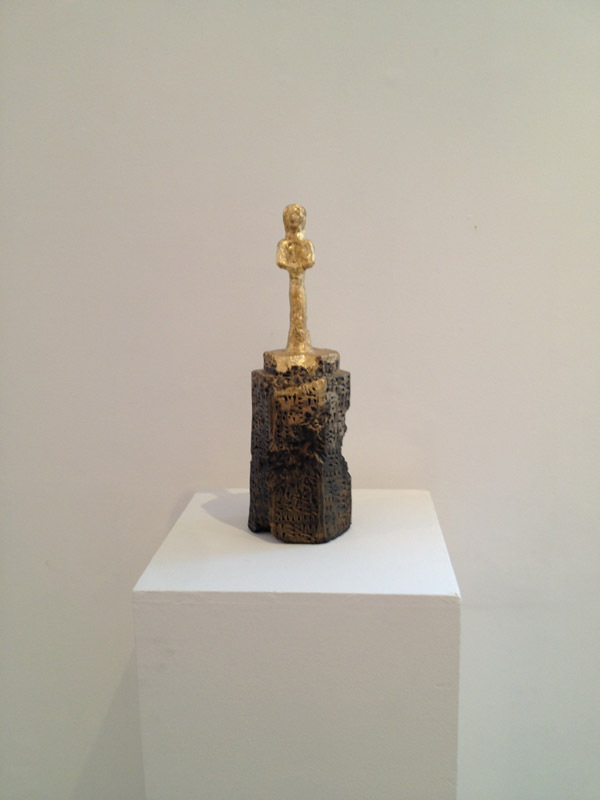 It is an interesting opportunity to explore how the ancient past continues to exist within the region’s subconscious. Compares favorably to the other 5,000 year old tumuli in the immediate vicinity. Previous tenant left no dust but occasionally seen floating around the neighborhood. Preferred deposit gold, silver or pearls. No paper notes are accepted.